Is Center Parcs a Marmite kind of place? It’s certainly not for everyone. 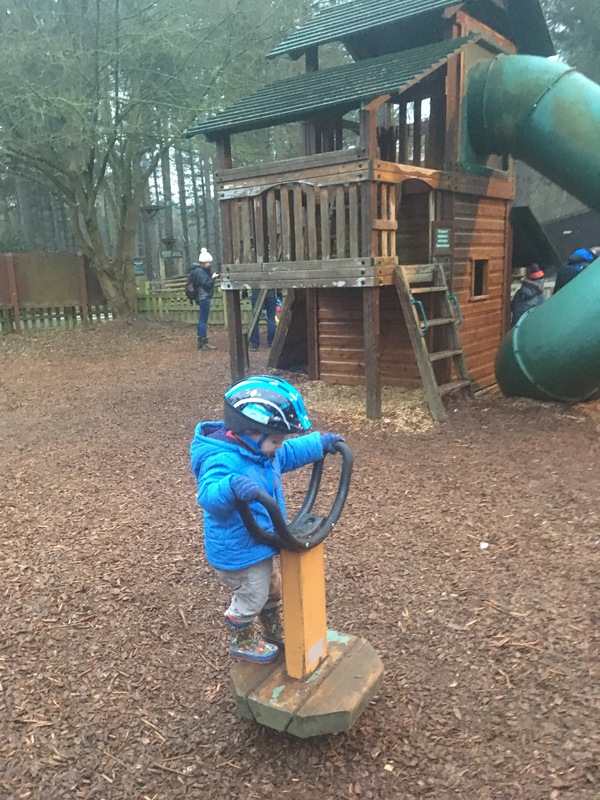 We have visited Center Parcs three times now and our most recent trip at February half term to Elveden in Suffolk was our first visit during a school holiday (our kids were 5 and 2). It was quite a shock going into the swimming pool on the Saturday with what felt like half of the UK’s kids, it was packed. We had a great time overall but we were pretty shattered by the time we got home. 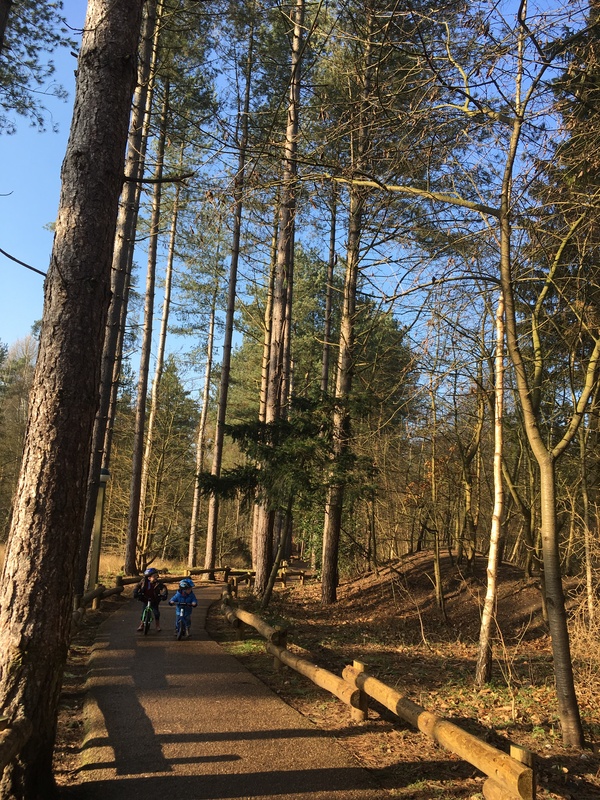 For those of you who’ve never spent half term at Center Parcs and are wondering whether it’s for you or not, here’s my lowdown on what to expect. The accommodation is pretty good quality and comes well equipped. Dishwasher, microwave, Wi-Fi and a fireplace all come as standard in the Woodland Lodge, which is the lead-in accommodation at Center Parcs. There’s a TV in both the living room and the master bedroom and there’s a large blackboard next to the kitchen which our kids enjoyed scrawling on during their stay. Cots are also included in all properties. If you’re happy to spend a bit more money, you can include a hot tub, sauna, games room or even stay in a treehouse (although I’d say that description is a little misleading as it looks more like a house on stilts albeit a very luxurious one). The staff are incredibly friendly and helpful: we discovered 30 seconds after arriving that our older son had a flat tyre on his bike and we hadn’t brought any inner tubes with us. We popped into the cycle hire workshop and the staff immediately replaced the inner tube for us at no cost (when they probably had better things to do with their time). This was our main reason for visiting Center Parcs. We’re keen to improve our kids’ confidence in the water and this is undoubtedly the place to do it: pirate ship splash area, lazy river, wave machine, slides galore, outdoor pool, warm “lagoon” pool, it really is a great place to take your children. There are free life jackets, a café, drying rooms (if you’re too lazy to use a towel), coin-free lockers (in some of the resorts, not at Elveden) and even family cabanas for hire where you can watch TV if you feel so inclined. 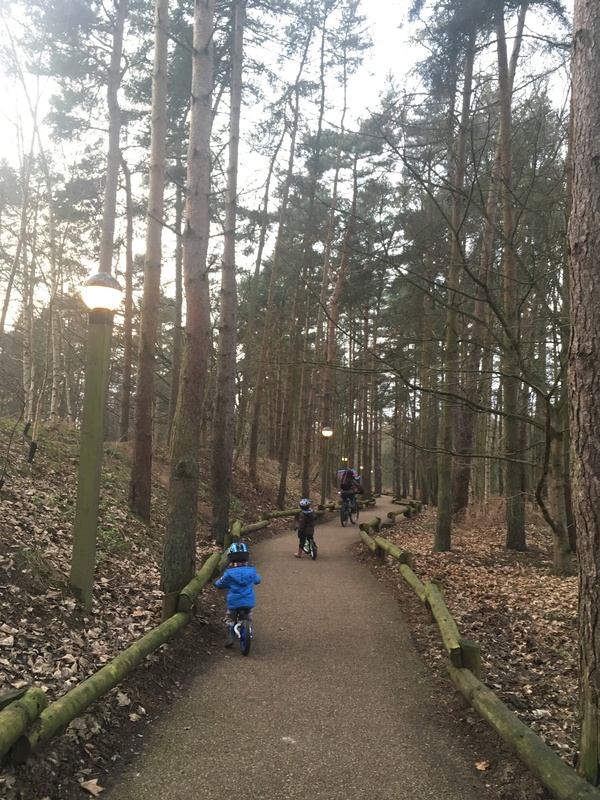 Center Parcs and in particular Elveden, is excellent if you have as we do, small children on bikes. 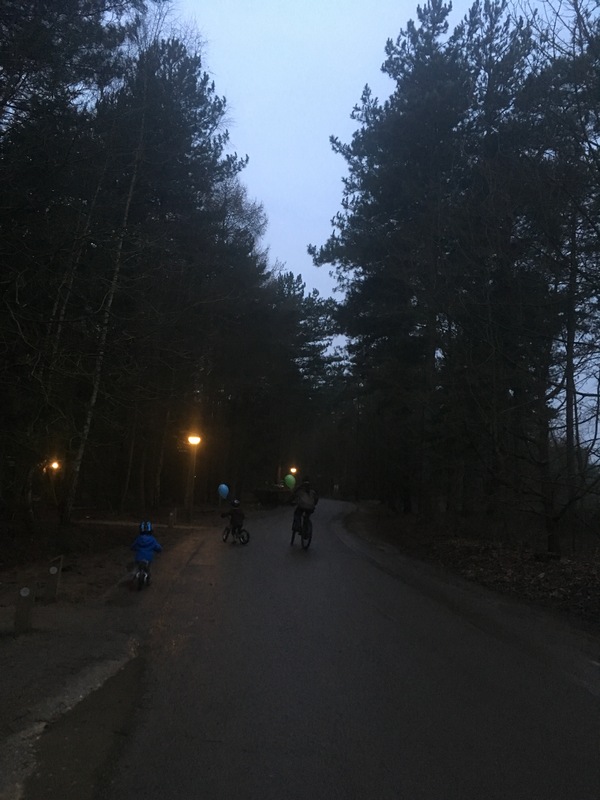 Elveden is pretty flat and once the cars are safely in the main car park (where they remain until check out) there are long safe streets and paths for children to whizz along to practice their cycling. 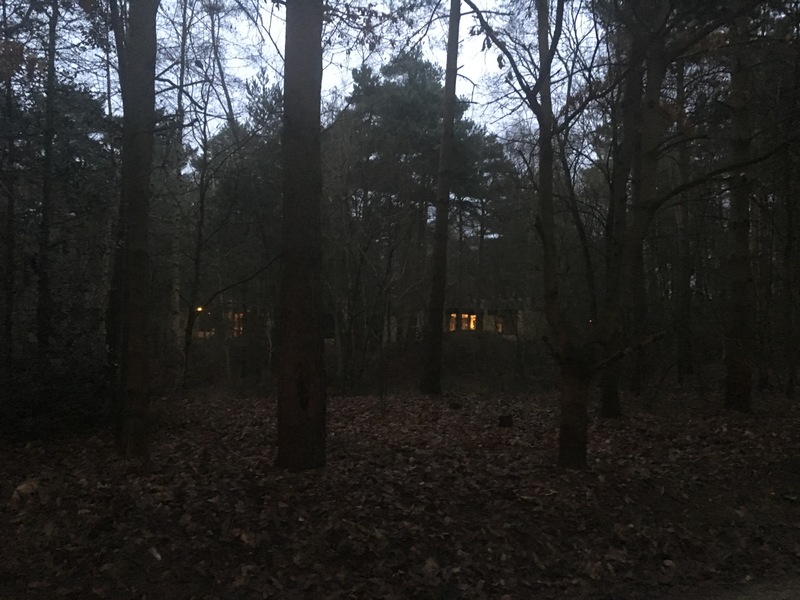 The landscaping has been really well thought out so you do indeed feel like you are staying in the forest (this is particularly so at Elveden, the newest resort of Woburn is more hilly and the accommodation doesn’t feel as well spaced out). In spite of it being February half term, the roads and paths felt pretty empty. You can pay extra to specify where on the resort you would like to stay. We didn’t reserve a particular lodge so we were allocated one at the furthest reaches from the resort centre. This really isn’t a problem as the walk from our lodge would only have taken about ten minutes. And it meant that our living room had an uninterrupted view of the forest and we had a great cycle ride each day up to the swimming complex. From our window we spotted rabbits, squirrels (unnaturally friendly unfortunately), a great spotted woodpecker plus a multitude of other birds. We also spied a muntjac deer on one of our bike rides. Cycling along the paths and roads, particularly in the evening, felt really lovely and the boys loved cycling in the dark with the their lights on (not something we’ve done at home yet). Although you can’t check into your accommodation until 3pm (or 2pm if you pay a bit extra), you can use the resort facilities from 10am. I’m so glad we headed to the pool straight after lunch on our day of arrival, it was the only time during our stay when it wasn’t completely rammed with people. Previously when we’ve visited Center Parcs it has been during term time when the swimming complex is much quieter. There are tons of activities (on which to spend tons of money); zipwiring, aerial tree adventures, wildlife walks, bowling, craft activities, tennis, football, spa experiences and so on. If you are part of a group with different ages and interests there is truly something for everyone. My father, who has mobility and balance issues, was delighted when he visited Center Parcs with us a couple of years ago, there were three wheeler bikes for hire so he was able to ride a bike for the first time in years. We made use of the childcare on one afternoon. Unfortunately our children couldn’t be in the same setting as they were five and two at the time (the crèche is up to age two and then it’s aged three to seven). It seemed rather strange abandoning our younger son at his crèche given that we had a gentle settling in process when he started preschool. However, he completely enjoyed it and didn’t seem remotely phased by us disappearing for the afternoon. Our older son took part in a pirates and princesses party which he also enjoyed although he looked pretty shattered when we collected him. It was freezing during the February half term, in fact it snowed for much of our visit. However, we were outdoors for a fair part of our stay, either cycling or making use of the playgrounds. One of the play areas is next to a bar with an outdoor terrace where grown ups can sit with a hot drink (or something stronger) and watch their kids. When we weren’t outdoors we were in the pool so aside from the childcare we booked, we didn’t actually pay for any other activities. 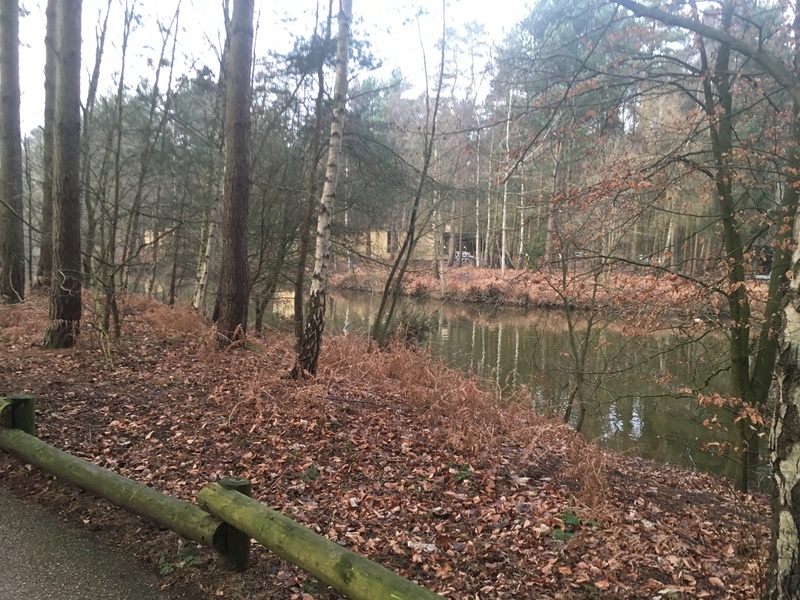 We stayed at Center Parcs for three nights from Friday to Monday. The swimming pool was PACKED on the Saturday, Sunday and Monday. If you’re keen on being in the water, my biggest tip would be to head straight to the pool as soon as you can on your arrival day. Although you can’t check into your lodge until 3pm, you can use the facilities from 10am on your first day. We were in the pool by around 1pm on the Friday and it was noticeably quieter, we later realised, on that first day than it was during the rest of our stay. We weren’t very organised when it came to booking activities. We had considered booking a spa afternoon while our kids were in the crèche but by the time we looked online (about a month before we were due to stay) it was full. But we ended up just cycling around and having a restful drink which saved us quite a bit of money. Center Parcs is quite a pricey place. As with all holidays, prices skyrocket during the school holidays. A four night break at Elveden for a two bedroom lodge from Monday to Friday over October half term is £1049 whereas the previous week is £599 and prices can be as low as £259 in January. If you’re considering visiting with small children, try to go before you’re tied to school holidays. We took advantage of a well-placed inset day which made our stay a little more reasonably priced. You really could part with some serious cash if you took part in something each day at Center Parcs. A fencing session for kids costs £9 for half an hour while pottery painting is £14.50 for an hour. Outdoors, kayak tuition sets you back £30 for an hour and the tree top high wire activity is £25. However, our kids were happy just hanging out in the pool, on their bikes and in the playground so we didn’t pay for any additional activities except for the afternoon crèche (£23 and £25). The eateries at Center Parcs are crowd pleasers: Italian, French, American and Indian cuisines are all covered but the menus are rather predictable and the snob in me did long for somewhere which wasn’t a chain. However, the staff were incredibly kind and patient with what must have been an endless stream of overexcited children. At lunchtimes the restaurants were surprisingly quiet but the evenings were sometimes fully booked. Each restaurant has a soft play area for children to disappear into before or after (or possibly during) the meal. I wasn’t a fan of this initially, I’d prefer meal times to be a moment of downtime but once the kids realised there was a play area everywhere we went, we succumbed and enjoyed a peaceful coffee after lunch. 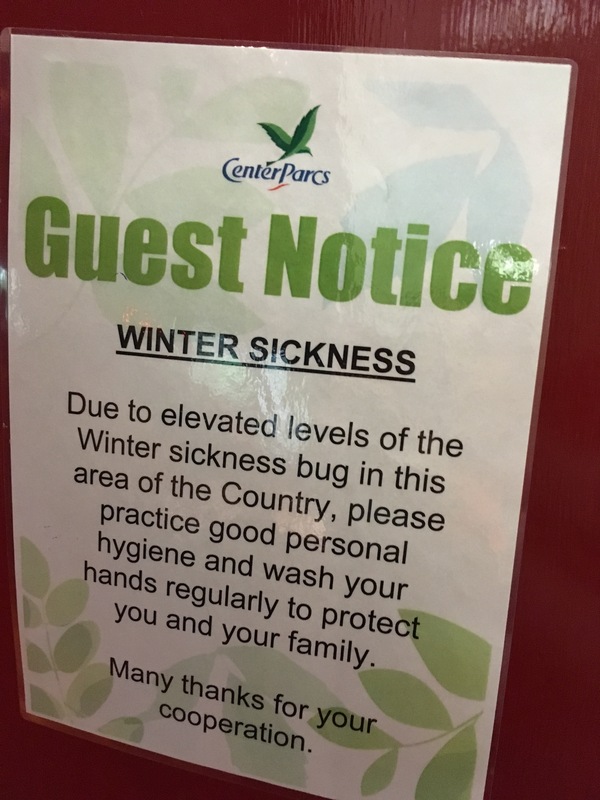 Half term at Center Parcs: forest escape? There’s no denying you’re sharing your forest escape with thousands of other people. 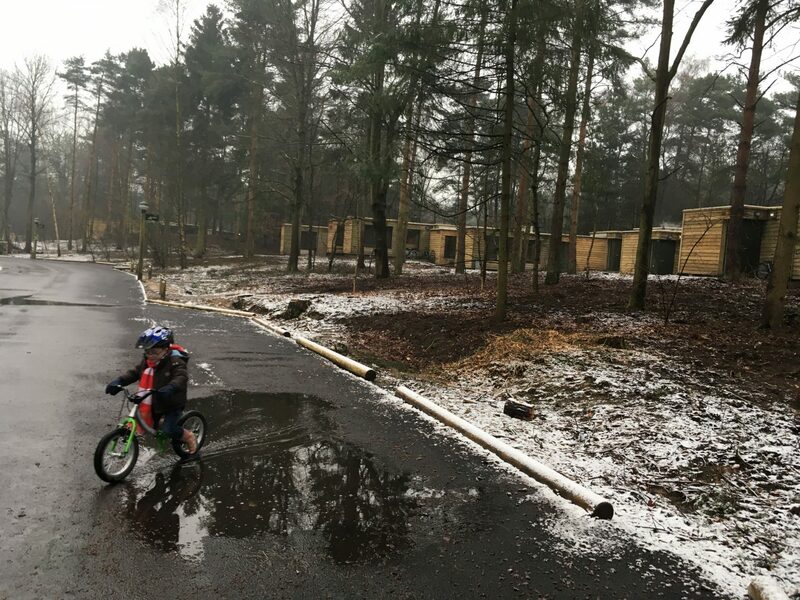 If you want a convenient, car-free experience with lots of amazing facilities all in one place, Center Parcs is definitely for you. It is managed extremely well and in spite of the obvious volumes of people, we never had to queue for anything. 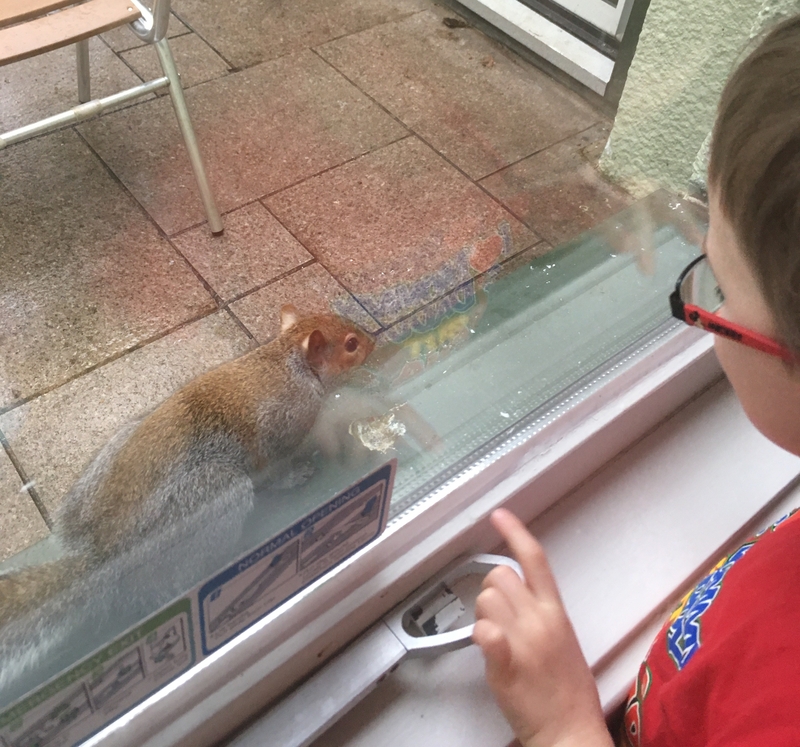 I think we will return to Center Parcs again when the kids are a bit older but I’ll be looking for a more relaxing and low-key break for our next UK holiday. Keen on a lodge experience in the woods elsewhere? we’ve also used Forest Holidays at half term. 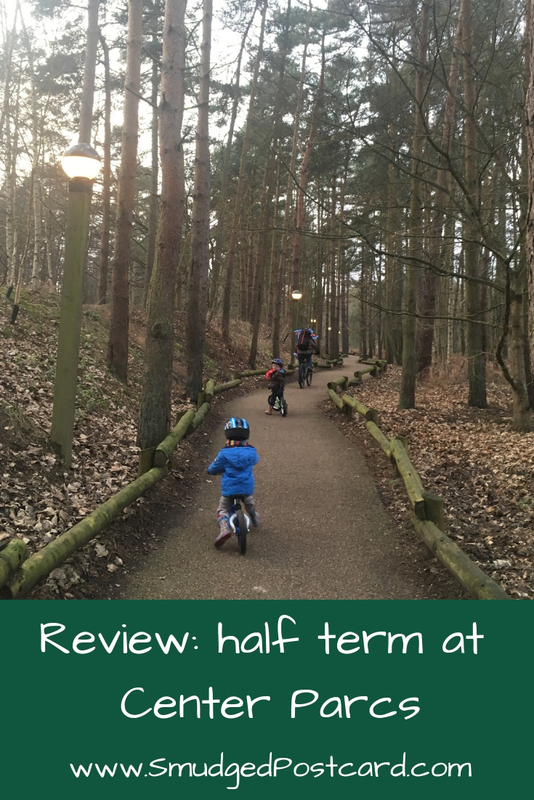 Have you spent half term at Center Parcs? Let me know in the comments below. Another thing to note, my bro rates the one in Wiltshire which has easy access to Longleat safari park and Bath if you need to escape! We love Center Parcs, have visited Longleat, Elveden and Nottingham. I think Nottingham is our favourite but the furthest away. I can’t wait to visit again. Why is Nottingham your favourite? Interesting to hear about other locations. I quite fancy visiting the Longleat one but maybe when my kids miraculously have a different school holiday to the rest of the country!